Winton is a town and locality in the Shire of Winton in Central West Queensland, Australia. Satisfy your inner culture vulture at Australian Age of Dinosaurs and Corfield & Fitzmaurice General Merchants. Spend the 11th (Sat) exploring nature at Bladensburg National Park. 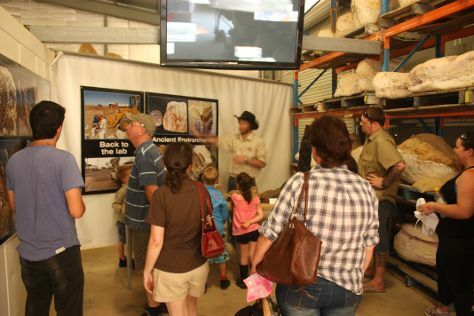 There's still lots to do: see the interesting displays at Waltzing Matilda Centre, have some family-friendly fun at Ben's Chicken Stampede, make a trip to Arno's Wall, and look for gifts at Winton Opal Gems. To find reviews and tourist information, use the Winton online travel planner . Albury to Winton is an approximately 20.5-hour car ride. You can also fly. Cap off your sightseeing on the 12th (Sun) early enough to travel to Mount Isa. On the 13th (Mon), get your bearings at Outback at Isa, then admire all the interesting features of Hard Times Mine, and then enjoy breathtaking views from Mount Isa City Lookout. To see traveler tips, reviews, ratings, and tourist information, refer to the Mount Isa trip maker . You can drive from Winton to Mount Isa in 5 hours. Another option is to fly. May in Mount Isa sees daily highs of 34°C and lows of 15°C at night. Finish your sightseeing early on the 13th (Mon) to allow enough time to travel to Boulia. Boulia is a remote outback town and locality in the Shire of Boulia in Central West Queensland, Australia. On the 14th (Tue), examine the collection at Stonehouse Museum. For more things to do, reviews, photos, and tourist information, use the Boulia route planner. Drive from Mount Isa to Boulia in 4.5 hours. Wrap up your sightseeing by early afternoon on the 14th (Tue) to allow time for travel to Birdsville. Birdsville is a small town and locality in the Shire of Diamantina, Queensland, Australia. Kick off your visit on the 15th (Wed): get outside with Birdsville Races and then admire nature's extreme beauty at Big Red Sand Dune. To see photos, ratings, other places to visit, and more tourist information, read our Birdsville driving holiday planner . Drive from Boulia to Birdsville in 7.5 hours. Alternatively, you can fly. In May, plan for daily highs up to 30°C, and evening lows to 15°C. Wrap up your sightseeing on the 15th (Wed) to allow time to travel back home.